On Tone 2 we are separated from the One Mind of Divinity to observe our own Human thoughts. We were inspired to take a Leap of Faith by following our own Truth. Through our Divine Instincts we Long to be One again. Through a Dream Inspired in Unity, we are offered a path that will lead back to the Whole and the Oneness we remember. The Intention of Each Tone presents us with a direction of Movement. We can always look at the Tone number to see what we’re inclined to be doing and thinking about. Each Day Sign offers a different way to look at it with its own way to carry it out. The Tone is our Direction, and the Day Sign offers one of 20 ways we can carry it out. The Intention for today is to consider a Choice. What do we want to Create? The first rule of Manifestation is that we must Love what we Intend to Create. With the Passion to Create – a Good Reason of Divinity – we’ll hold the Power of Love to make the journey from the Beginning to the End. Storm/CAUAC demonstrates the Place of Truth as our Home Within. Whenever we see a storm on the horizon, we naturally run for Home. The Flint/ETZNAB guides us to live by our Truth, on purpose. Today we are called to run Home. Residing in the Center, ALL the storms of life will exist on the parameter. We will find our Peace and Truth in the eye of the storm. From a Center of Power, all the chaos of life will be no more than an illusion we can watch going by. We can let it go by without trying to change it. Tone 8 holds the Intention of Justice. Tone 8 is the Holy Day of the trecena as the Zenith Hour of Light. The Creator’s most Divine Intention was Harmony and Equity for ALL. Tones 8 through 13 represent the Transformation phase of the trecena. The stairs leading up are our Human climb of Spiritual Growth. The stairs that descend are powered by an Unseen Force as the Intervention of Divine Justice. On Tone 8 we are changed by a new Truth. Once we see it, it will always be Known as the Wisdom of our Experience. Storm/CAUAC is the Day Sign of Renewal and Regeneration, a symbol of the Creator’s Power to connect to Human, like a charge of electromagnetic energy. CAUAC holds the power to align all the pieces and parts of us so we are attracted to the Source of Unbridled Power. CAUAC always brings the Comfort of Home, to remind us that Home is the place to go when we see Storms on the horizon. CAUAC reminds us that we are Divinely Led and a Provision was given for everything we need to do. We didn’t have to learn to come home in the storm. It’s already Human’s way. The Road/EB trecena is revealing that everything we need to do, our Spirit is already guided to do by a Divine Instinct. There is momentum in our Divine Instincts – ways that Human has always followed, and a path well worn and easy to find by every following generation. The calendar of Human, is a calendar IN Human. We were given an Inner Guidance System that would naturally draw us toward our Divine Destiny. An Almighty Power would have the Authority over Human Intentions. This Gift is the foundation of Divine Justice… ONE Divine Source of Justice. 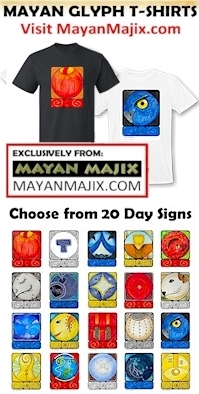 Happy 1 Storm/CAUAC Mayan Birthday to Michael Shore at MayanMajix.com. Thank you for carrying on the Mission of Ian Xel Lungold, delivering Wisdom and Hope for the Renewal and Regeneration of the Human Spirit! On 13 Flint/ETZNAB we Ascended with the Divine Discernment of our own Truth. We were awakened by a Flash of Truth that we could Know without any proof or physical evidence. We learned what our own Truth Feels Like, enough that we’re willing to dream about the possibilities. We begin again, believing in the Direction of our own Truth. Storm/CAUAC offers a Gift of Lightning Energy for the Renewal and Regeneration of our Spirit. CAUAC opens a Channel of Faith that fills us with Hope and the Freedom To Be. CAUAC is known as the “delivery midwife,” the one that guides the baby through the birth channel. CAUAC can deliver us into a Whole New Experience of Being, and Dreams we never dared to Imagine. CAUAC returns us to the Comfort of Home. Home is the place we instinctively turn to when we see a Storm on the horizon. CAUAC offers the place for us to go to weather all the storms of life. Residing in the Center within, we can watch the chaos of the world go by without being moved by it. CAUAC offers Hope in a place of Sanctuary where we Remember our own Authority of Being. We can imagine all the possibilities of Happiness within the safety of a Dream. Residing in the West, the direction of the Unknown, CAUAC Lights up the Dark for a view of all the possibilities. Holding the Element of Water, CAUAC can touch our emotions and our Spirit. Like a touch of Lightning, CAUAC can grab our Heart and send a new surge of Life through our veins. Our Ascension is 13 Monkey/CHUEN, a Divinely Empowered Creator. We’ll grow to Know that not only are all our Dreams Possible, but every wild idea we Love is Worthy of Creation. 2 Sun/AHAU completes the 4th Uinal of Stability. In the harvest cycle of this Tzolk’in round, we were the sprout sending down roots to Mother Earth for Stability, and pushing ourselves upward, expanding in the Light. We learned what we needed to survive. 2 Sun/AHAU guides our next Divine Choice. We get to choose what we want to Believe we can Create. We don’t have to know anything. We can Ask to Know. 3 Crocodile/IMIX begins the 5th Uinal of Empowerment. Taking on our first leaves and branches, we are beginning to identify what we are intended to become. We can see who we are by others with the same leaves. In the 5th Uinal we are Inspired to Dream of how our Tree would be different, a Dream Higher than just learning how to survive. Our Transformation is completed through cycles “Light” (Night), and “Dark” (Days). Spirit is always a mirror reflection of the world below. In our Dreams at Night we saw the Light of an Inspiration, existing as One with the Creator. Then we wake up, trying to carry out a Dream that was clear when we were asleep, but we now only have daydreams and Faith to go on – our own Light. We create from Inspiration and learn to manifest through the Wisdom of Experience – a Balance of Light and Dark. Storm/CAUAC offers a Spark as Bright as Plasma that breaks through the Light and the Dark, to Inspire the Dream of our Heart’s Desire. 6 Seed/KAN – establishes a Rhythm, Flow, and Pattern of thought that defines our own perspective and identity. 7 Serpent/CHICCHAN – lights the fuse that turns Faith into Believing that Dreams that touch our Heart, hold the Promise of Coming True. 8 Transformer/CIMI – begins the Transformation of our Major Life Change, fulfilling a Promise of Human’s Divine Justice. 9 Deer/MANIK – our Transformation is completed by Divine Guidance, and a Spiritual Tool that overcomes every Human limitation. NOTE: Transformer/CIMI is the Sign of Major Life Change. At Tone 8, CIMI resides in its Zenith position. March 6, 2019, 8 Transformer/CIMI holds the potential to be a day we remember as a milestone of change. It’s a Day to Stand in the Truth that chaos is always the first sign of every Divine Transformation. Storm/CAUAC brings the Blessing of Renewal and Regeneration. CAUAC brings the Comfort of Home. “Home” refers to our Center within where we hold ALL the authority of Being. We can shut the door to the world behind us. Storm/CAUAC offers the energy of Renewal and Regeneration as a Gift of Power from the Above to the Below. Like a Storm on the horizon, CAUAC calls us Home to a place of stability within. CAUAC displays an unbridled freedom that follows its own path. Storm illustrates the magnetic connection between ourselves and the Creator. Lightning is not bound by any direct path, but can find its way in or around anything that lies between us. CAUAC can regenerate our youthful enthusiasm. CAUAC reminds us of the Lightning Power within. Our “Force of Nature” is a connection of Shared Consciousness. 4 Storm/CAUAC brings the comfort of home, the place where we hold the Authority of Being. Tone 3 holds the Intention of Movement. Our Intention takes on the life of Vibration through movement or communication. Our Intentions of Unconditional Love generate the Highest Tone and Frequency. When we take action on Love we create a Song that calls lower vibrations into synchronicity. Storm/CAUAC is the Day Sign that brings the comfort of Home. CAUAC symbolizes our Lightning Connection with the Creator. The Lightning of the Storm brings Renewal and Regeneration to Mother Earth as a gift of Nitrogen. Lightning’s charge also reaches Human, wherever we are, to ignite our Gifts of Knowing. CAUAC shares a Gift of Power between the Above and the Below. A power like electricity, ignites our thoughts and opens us to new perceptions of Consciousness. Vibration influences all our experiences. Our experience of color is based on the range of frequencies the Human eye can see. So is our range of experience influenced by the frequency of our own vibration. CAUAC holds the Power to Raise our Frequency to a Higher Consciousness of our Connection with the Creator. The Creator’s Lightning is an unbridled Power that opens us to an experience of Higher Vibration that enhances our perception of Divine Truth. We are given a new range of vision in Spirit to Discern the Intentions of Love.